Computer-to-ipod-to-ipad maker Appple Inc has its annual shareholder's meeting scheduled for Februrary 23rd, and there has been intense speculation on whether Apple will share a succession plan. Bloomberg reports that at a resolution slated for vote at the meeting, the company will be asked to explicitly state what plans they have for a replacement CEO. The proposal has the backing of the Laborers' International Union of North America (LIUNA). It also has the endorsement of the Institutional Shareholder Services (ISS), the country's largest proxy voting service. According to a release by LIUNA, "All companies should have succession planning policies and succession plans in place, and boards should periodically review and update them," ISS reported in the analysis of its proposal. Steve Jobs sent an email to all his employees on January 17th this year. The email quoted Jobs as saying that he had requested and been granted a medical leave of absence from the company. He would continue to be CEO of the company. Now, it is no secret that Jobs had a bout of really bad health. He had surgery for pancreatic cancer in 2004, and is believed to have a liver transplant some years later. During the last several weeks, there have been more Steve Jobs 'sightings' in Silicon Valley than UFOs in the same amount of time, and there seems to be a morbid interest in his health. 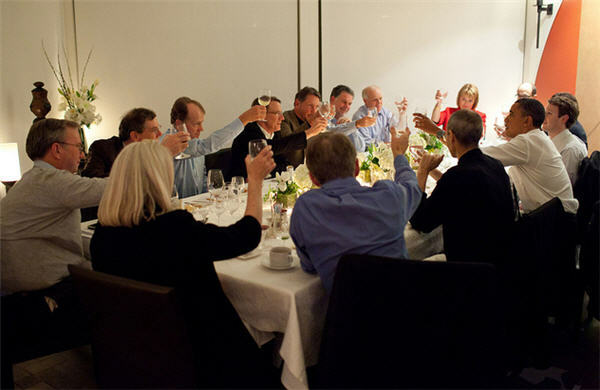 Jobs, however, was present for a dinner with President Obama (see picture, Jobs is seated left to President Obama) and other technology wizards (Eric Schmidt, Mark Zuckerberg, and Larry Ellison to name a few) just a few days ago, and raised a glass in toast. In other news, the company is expected to introduce a new version of the iPad in March this year, as reported by Kara Swisher of All Things Digital. The latest avatar is expected to be thinner and have front-facing cameras and video chat. There are also rumours doing the rounds that the tablets will run on both GSM and CDMA networks. Apple is believed to have sold some 15 million iPads in 2010.